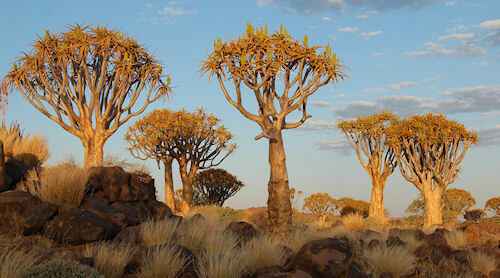 The Quiver Tree Forest is located north-east of the town of Keetmanshoop in southern Namibia. Here grows, on a private farm, about 250 specimens of the quiver tree, or aloe dichotoma, which is a tall, branching species of aloe. The unusual look of aloe dichotoma has made this area a popular tourist attraction. The quiver tree is not really a tree, rather a plant of the genus aloe. It has a stout stem that is covered with beautiful golden brown scales with sharp edges.